Emil Kiessling GmbH relies on the TFR technology from Dresden (Germany) for wastewater treatment. Emil Kiessling GmbH with headquarters in Georgensgmünd, Middle Franconia (Germany), is a successful cosmetics manufacturer. The product range includes natural cosmetics through to sun protection. Via a trade fair contact, DAS Environmental Experts GmbH from Dresden was commissioned to optimise the wastewater disposal of the company. Many substances used in body care products can cause major damage when they enter water systems in high concentrations. With all the fragrances and colouring agents, essential oils, emulsifiers and surfactants, it quickly becomes too much for a municipal wastewater treatment plant to handle. Because Emil Kiessling GmbH places great importance on responsible and sustainable production, the company wanted to treat the wastewater within the company so that the subsequent disposal can take place via the municipal sewer system without problems and with no risk to the environment. In close cooperation with the representatives at Emil Kiessling GmbH the water experts of DAS Environmental Experts GmbH developed a concept an advanced wastewater treatment. Their goal: Reaching a maximum reduction of the wastewater’s chemical oxygen demand (COD) at a minimum of costs. At Kiessling, a combination of chemical-physical and biological wastewater treatment now helps to relieve some of the strain on the sewage system and the municipal wastewater treatment plant. 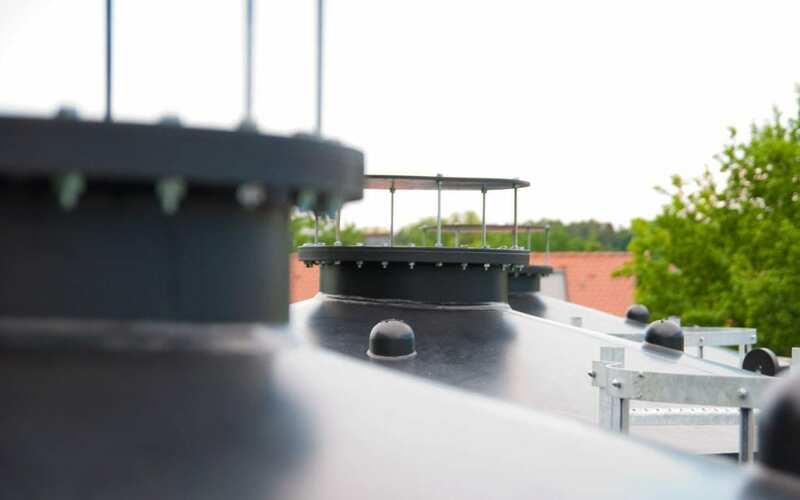 The installed system is large enough for a small town with a population of 5,000 and, thanks to the TFR technology from the environmental technology specialists from Dresden, uses up to 45 per cent less energy than other systems of a similar size. Wastewater treatment is a major challenge for a cosmetics manufacturer. Kiessling produces around 1,500 products based on over 600 recipes. “This means that the wastewater quantity and composition of the pollutant load is changing constantly”, states René Reichardt, Head of the Water Treatment Division at DAS Environmental Experts GmbH. The wastewater specialists have found a technical solution, which enables the wastewater from production to be cleaned reliably and economically, despite these difficult conditions. The heart of this wastewater treatment system is the patented TFR bioreactors (TFR – Trickle Flow Reactors) from the Dresden based company. But before the pollutants are removed from the wastewater in this system using microorganisms, a mechanical pre-cleaning process must first take place. After this step, demulsification takes place in the first treatment phase using ferric(III) chloride with a subsequent precipitation/flocculation stage. The resulting silt is separated through flotation. The pre-treated wastewater is then stored temporarily in a mixing and compensating reservoir with a capacity of one hundred cubic meters to enable homogenisation. After neutralization, microorganisms are the key players in the aerobic biological transformation of the remaining organic substances in the wastewater. In the TFR bioreactors from DAS Environmental Experts GmbH, the wastewater runs from top to bottom via a substrate consisting of small, light balls with a high specific surface area, explains Reichardt: “This substrate is covered in special microorganisms in the form of biofilms. These microorganisms can decompose organic substances and a variety of pollutants in a targeted way.” The result: biomass, water and carbon dioxide. The silt produced in the individual treatment stages is drained and passed on for disposal. The microorganisms in the TFR bioreactors are supplied with oxygen via a fan, which blows in ambient air at the base of the system. “No additional pressure is required for this, as the reactor is not filled with water”, explains Reichardt. “Excess biomass is flushed away at regular intervals for regeneration.” Otherwise, the system is almost maintenance-free; energy consumption, operating costs and wear are low. The wastewater at Emil Kiessling GmbH is produced in batches. The composition and concentration of the organic substances in the wastewater vary considerably. Another problem is the variety of ingredients and the salt content of the wastewater with a chloride concentration between 1,500 and 2,500 milligrams per litre. These conditions represent a major challenge for a biological process. The TFR technology was therefore tested directly on-site in a four-month test operation. Emil Kiessling GmbH was impressed by the technology itself, the technical implementation, the stable output of the reactors and the direct on-site supervision of the system by the employees from DAS Environmental Experts GmbH. Hence, construction of the large plant began in autumn 2009. The system was commissioned in spring 2010. “Cost-performance, stability of processes and flexible professional service were the criteria of Emil Kiessling when searching for a new wastewater treatment system. From a number of candidates DAS convinced us the most. We installed three TFR Bioreactors. After this long-term operation we are enthusiastic about the system‘s design, the service as well as the commitment of the entire DAS team.“ says Roland Krauss, Manager of Emil Kiessling GmbH. The system at Emil Kiessling GmbH consists of three TFR bioreactors, the matching ventilation and backwash system, dosing units for nutrients and antifoam emulsion, sludge processing and the relevant measurement and control technology. Each reactor is eight meters high with a diameter of three meters. The gross volume of each reactor is 55 cubic meters. This corresponds to a total gross volume of 165 cubic meters. 125 cubic meters of wastewater need treating per day on average, with a pollutant load that corresponds to a chemical oxygen demand (COD) of around 3,000 milligrams per litre. In the forth year, the average degradation rate achieved was 91 per cent. The COD discharge values lie significantly below the specified 1,000 milligrams per gram COD. The evaluation of the COD concentration shows that, even with concentration peaks of up to 6,000 milligrams per litre, the specified value of 1,000 milligrams per litre in the system outlet is still complied with. The fact that the system has been operating reliably over many years shows that the TFR technology is suitable for complex applications. This process is particularly useful for wastewater from the cosmetics industry, where there are major fluctuations in both the ingredients and concentration. In addition to the high level of stability afforded by the process with regard to disturbances, such as a temporary entry of disinfectants, fluctuations in the pH value, high salt contents and changes in temperature, the excess oxygen within the system in particular also plays a major role.